Tax relief on donations of €250.00 or more means that Dublin Simon Community can make your generosity go even further to help those experiencing homelessness. For each donation totalling €250.00 or more, we can claim an extra €112.32+ in tax back from the Revenue Department. This additional funding is invaluable to keep our services running throughout the year! This amounts to 31% extra for each donation, the larger your donation, the higher the amount that we will receive back from Revenue. We can now claim the tax back for self-assessed tax payers as well as PAYE tax payers who have made donations totalling €250.00 or more per tax year from 2013 forward. 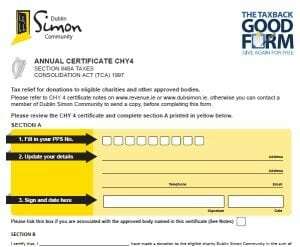 Claiming this tax back for Dublin Simon Community applies to one-off donations or separate installments in a given tax year, such as monthly donations. You can now sign up to give Dublin Simon Community permission to claim the tax back on your donations for the next 5 years. This will benefit us as it will ensure less time and money is spent on administration and will be more convenient for you. It does not mean that you are committing to donate for another 5 years, it means if you do choose to donate again, we have the permission to claim the money back on your future donations. If you have any questions please call us on 01-4722150 or email inforequest@dubsimon.ie for advice. Companies who donate to Dublin Simon Community can themselves avail of tax relief on their donation as we are a registered charity, our registered charity number is 5963.